Daniel Cormier isn’t the only man with his sights set on the recently-reinstated Jon Jones. 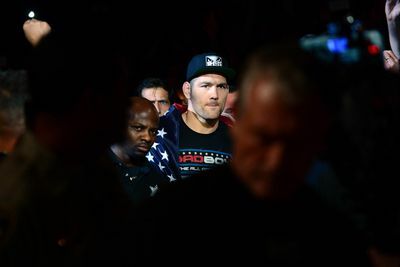 Ultimate Fighting Championship (UFC) middleweight champion, Chris Weidman, says he’s close to cleaning out his division, and may soon be ready to take his talents up to 205 pounds to take on the best the light heavyweight division has to offer. Of course, “All American” isn’t looking past his upcoming title fight against Luke Rockhold, which is slated for UFC 194 on Dec. 12, 2015 in Las Vegas, Nevada. “I’ve got to focus on Luke, and the winner of ‘Jacare’ [vs.] Romero. And then after that, we’ll start talking about Jon Jones, and 205, and anyone who is good, up there,” declared Chris during an impromptu Periscope session (via FOX Sports). Weidman has three consecutive title defenses to his credit, taking out top names such as Anderson Silva, Vitor Belfort, and Lyoto Machida. A win over Luke only further bolsters his resume. After that, it seems there is only one more 185-pound title fight awaiting “All American.” Once that’s in the bag, he feels there’s no one left at 185 pounds for him to beat.